Right now is strawberry season in Florida. This means that you can get loads of amazing strawberries for ridiculously low prices! A couple of weeks ago, we headed over to the Florida Strawberry Festival and on our way home we stopped by a local farm stand to get a ton of strawberries since this year we had some major plans for them. Between us and our friends, we bought six flats of strawberries which comes to 72 pints (at 66 cents/pint). This may seem like a lot of strawberries, and it is, but as I said, we had plans this year. Three of the flats went to the guys to make strawberry wine, one flat a piece went to me and our friend Emily to make various stuff with and then our families split the last flat to eat. Once your strawberries are ready, it's time for sugar. 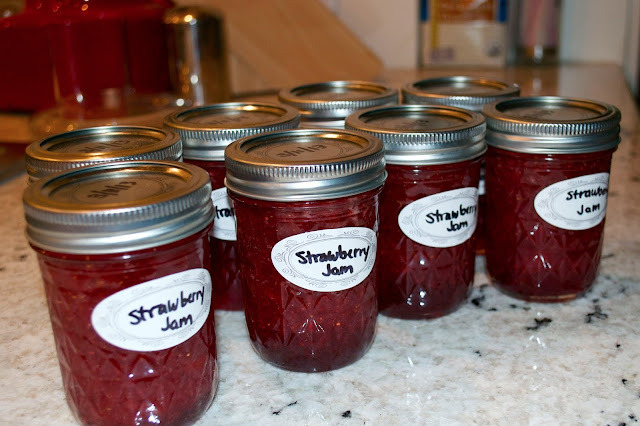 There are a ton of recipes out there for jam and you really can't go wrong with any of them, but as a generally rule, there is a lot of sugar and either pectin or lemon juice to help with preservation. The more acidic something is, the easier it is to can without a pressure cooker. I prefer the taste of jam with lemon juice so for this batch, I used 8 cups of whole strawberries, 7 cups sugar and about a 1/3 cup of lemon juice. I also mix the smashed/chopped strawberries with the sugar and let it sit for an hour or so before I add the lemon juice and start cooking. You want to slowly get your mixture up to boiling (over about 20 min). You also want to use a fairly large pot. 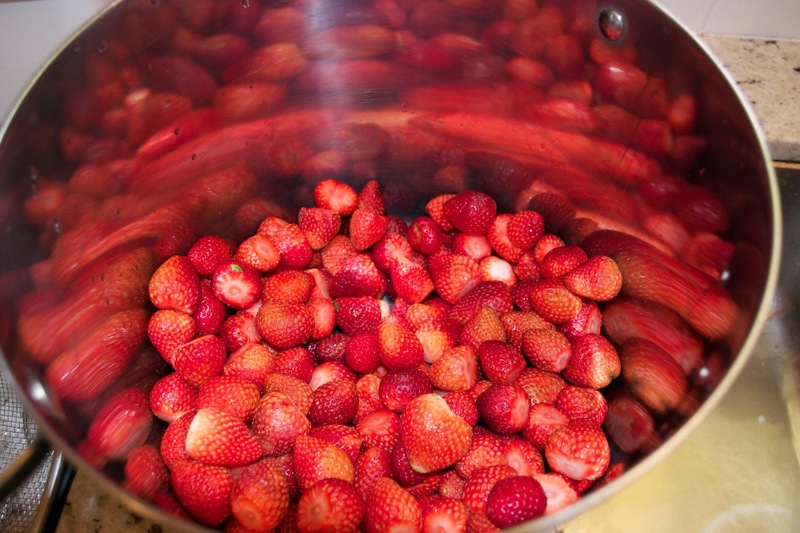 When the strawberries boil, they expand A LOT and if you aren't paying attention you can get a really big mess really fast. 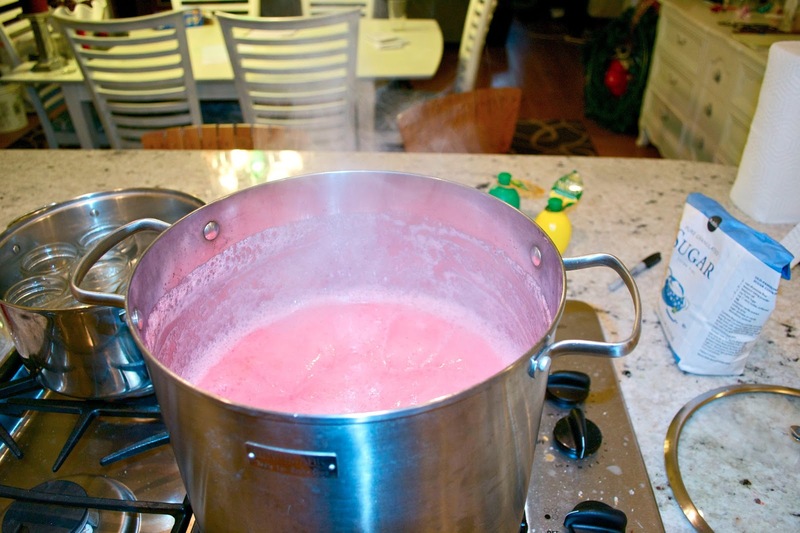 You want to let the strawberries hard boil for about 5-10 min. You can test the thickness of your jelly on a cold plate but I don't usually bother with this step. Once the jam has cooked, you can remove it from the heat and you can remove some of the foam from the top to make you jam cleaner looking. While your strawberries are cooking, you need to get your jars ready. You want to clean and sterilize your jars and lids. I usually do this by cleaning them and then putting them in a pot and boiling them for about 15 min. This also gets the jars up to temperature so you don't put hot jam into cold jars. I leave the jars in the boiling water until right before I need them and then use tongs to pull them out. You then fill the jars with the jam, place a lid on top (once again with the tongs) and then screw on the outer lid so that it is on all the way but not overtightened. 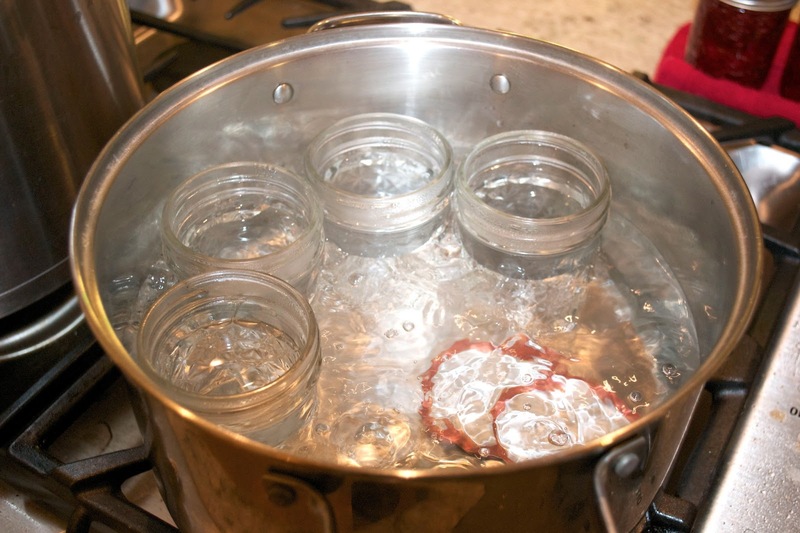 Your water should still be boiling from your jars. I pour about half of the water into the strawberry pot to help with cleanup and then place the jars of jam back into the pot. The water should come to right below the lid and should boil for about 20 min. Take off heat and let sit in the water for about 5 more min. 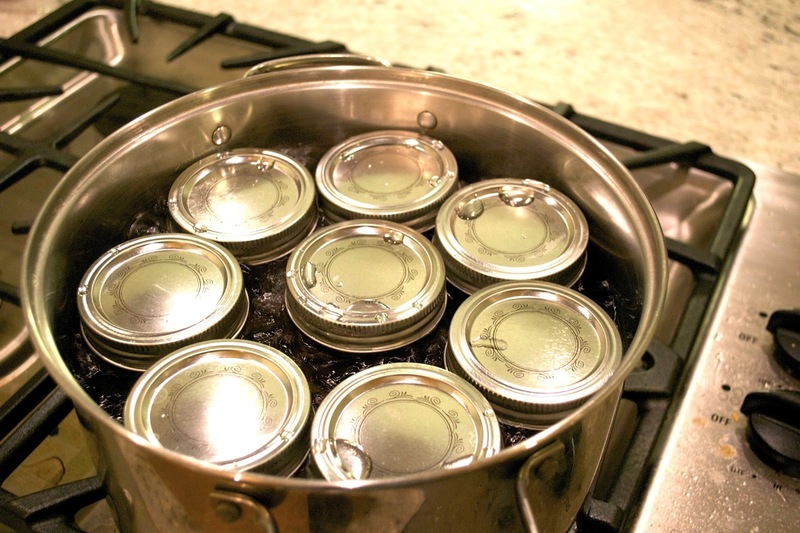 Take the jars out of the pot and let completely cool to room temperature. As the jars cool, you should hear a popping noise as the jars vacuum seal themselves. When they are completely at room temperature (4-8 hours later) they all should be sealed. You can test this by taking the outer lid off and pressing on the center of the lid. If it is sealed, there should be no play in the center. If any of your jars don't seal, just stick them in the fridge and use those first. For the sealed ones, I like to label and date them and then stick them in the pantry for months of yumminess.